A design document shows an example of Google Chrome extension. For now, extensions are just fancy wrappers for user scripts, but there are plans to make them more useful by exposing browser features and allowing developers to create interfaces. Before trying to install the extension linked at the bottom of Google's tutorial, you need to have a recent developer build or Google Chrome 2.0 beta. Download the extension, extract the content to c:\myextension and launch Google Chrome. The only visible effect of the extension is that it replaces the logo from Google's homepage with a lolcat, but you can edit the file foo.js and enter a different URL for the image. They sure are taking Chrome slow. Josh, I hope you're being sarcastic--the Chrome team has been releasing new versions nearly every week.. He's either sarcastic, or an idiot. I've never seen a browser move as fast as Chrome does. It's updated constantly with new features, fixes and improved internal engines. When we can expect add-ons like features in chrome? I thought the purpose of Chrome was to be a skinny browser that isn't bloated with extensions like Firefox. If you want functionality without compromising speed, look at Opera's model, with built-in features. If you compromsie speed for functionality, you get Firefox with 100 extensions. Can people just realize that the extension model is slower than built-in, and stop trying to be ultra-fast while having every feature you want.... Google, extensions is a step in the wrong direction. Firefox replaced Mozilla Suite to be lightweight, but as it turns out, it has a greater memeory footprint and still pretty slow startup time. Learn from Mozilla's mistake. >I've never seen a browser move as fast as Chrome. Yup, Safari 4.0 moved a lot faster than Chrome. It stayed on my HD for maybe 5 to 10 minutes before I hit the uninstall button. Does anyone know how to add a right-click menu item so I can invoke a external download tool when click a link? I use Chrome 2 and Chromium with a huge collection of bookmarklets. When i need it I run the bookmarklet I want. That way Chrome is still the fastest. Internet Explorer FTW!!! Now that's sarcasm. Chromes nice but like "RICARDO GALVÃO" said moodle don't work too well I still have to use FF for that. I enjoy the full use of my screen (42" plasma yes its a tv) so chrome just does what I need it too. What I hate about Chrome is the inevitable "This webpage has a redirect loop." Anybody know how to fix that??? Can't wait to see what extensions are build out for Chrome. Obviously, Google is tip toeing in here. Extensions for Chrome are a must to compete with the Firefox user base. Moved form firefox to Chrome. I know it's a big change. I've set up on the Dev channel and started messing around with extensions and so on. I'll tell you this, in 2 years time Chrome will be the NR 1 browser. bold statement, but just watch. How is it a mistake to try something new Anonymous? Goal is fast browser with extensions. It would be nice to have a browser with both. I hope they succeed. You make some valid points, but I don't really see where Google stated that was Chrome's Aim. You can see that they intended to have add-ons from the start - they have provided the task manager and included extensions as part of the "sandboxed"/"own process" model, so that we will actually be able to see which extension is hogging the memory/where it's being leaked. Extensions do cause bloat, but not including them would be Chrome shooting itself in the foot. And at least we will be able to see where the bloat is coming from, and choose to not include the bloated extensions. Regardless of the fast-and-loose use of the word "extension" in the previous comments and above article, these are not extensions in the normal sense of the word. An "extension" -- in modern browser speak -- is something I can download and install with two clicks. Instead, you're asking me to create folders, modify shortcuts, replace dlls, download "developer builds," etc. That's not extensions, nor is it a sign of a ready-to-use browser. If you actually think that the extension framework will continue to be the same as it is now upon release, you're flat out wrong. What we're seeing right now is incomplete. It is not feature rich, yet. Give it some time (and I emphasize _some_ as Google is clearly coding at a ridiculously fast rate), you may be surprised. As for the "speed" concerns: Give it up. The way Chrome is designed speed will not be a factor as much as it is with Firefox. Developer builds are not for public use and not stable versions of Chromium. In current dev. 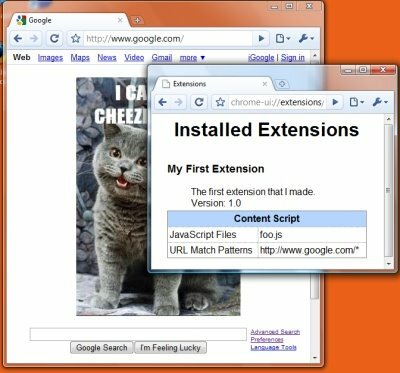 releases of Chrome there are normal way to install extensions e.g. "Download and install" w/ two clicks. Loading unpacked extensions is for developers and testers. For anybosy else there's more stable releases for use. How can i enable the extensions under the MAC version? Still have the contents to this tutorial?